Greetings from St. Gregory’s Parish in Sitka! I am here for the week on one of my pastoral visits during this Year of Faith. 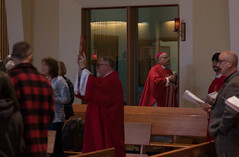 I have already concluded similar visits to the Cathedral, St. Paul the Apostle Church, and St. John by the Sea Parish on Prince of Wales Island. These visits have been a real blessing for me personally and I have thoroughly enjoyed the time with the various groups of people. 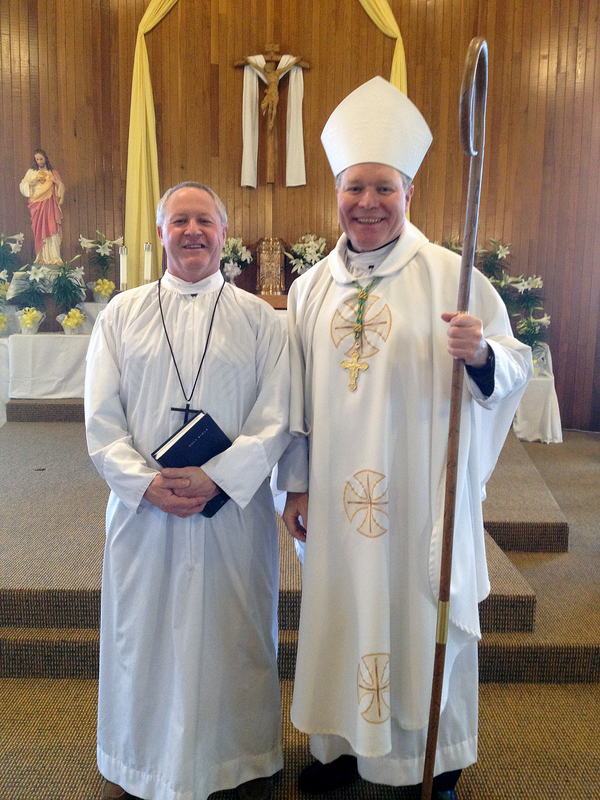 Ron Mathews—deacon candidate—stands with Bishop Edward Burns after Mathews’ installation as lector at St. Gregory Nazianzen’s in Sitka during the Bishop’s Pastoral visit to the parish on Saturday, April 6th. While I am here at St. Gregory’s Parish I will be participating in the blessing of the fleet, meeting with the superintendent of schools, the mayor, and the police chief, conducting a radio interview, touring the Coast Guard base and having dinner with the Coast Guard staff as well as meeting with the native tribal leaders. I am also having a parish town hall meeting in preparation for our Diocesan Synod, and conducting an open public forum at the Centennial City Center. At the Saturday evening Mass I had the privilege of installing Mr. Ron Mathews into the ministry of Lector as a part of his formation process preparing for the diaconate. 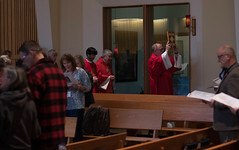 I have met with the young people with whom I will be celebrating the sacrament of Confirmation on Sunday, April 14, 2013. Many of them come from the various communities in Northern Alaska and attend Mount Edgecumbe High School. This current visit occurs as we conclude our Octave of Easter. The celebration of the Resurrection of our Lord as well as the many recent events within our Diocese has brought me to reflect on the newness of life within the Church. First and foremost, I am mindful of those who have been received into the Church through the Easter sacraments. This is an opportunity for me to express, on behalf of all the parishioners of the Catholic community in Southeast Alaska, a word of welcome. It is my hope that you find in your new faith journey with us through the sacraments of the Church, the celebration of his Word, as well as living the rich traditions of our church, a welcomed place where you feel at home with the Lord. Allow me to encourage you to stay strong in the faith and continue to learn, with all of us, the great richness of our Catholic tradition. At the same time, I am grateful for all the catechetical programs in our parishes as well as the dedicated and committed men and women who share the faith with others. Let us stay focused and committed to proclaiming Jesus Christ as our Lord through his Mystical Body, the Church. In addition to celebrating the newness of life in the Church through the joys of Easter, I am grateful for the wonderful impact our new Holy Father, Pope Francis, has had on both Catholics and non-Catholics alike. It was during my recent pastoral visit to St. John’s by the Sea that a parishioner indicated with great delight the positive impact the election of Pope Francis and news about him has had in their community and how all this reflected a wonderful image of the Catholic Church. As I travel the Diocese, I am also struck by the number of new faces that we have in our parish communities. As we all know, many people transition in and out on the Southeast Alaska region. I am edified to know that all those who come here, whether for a brief stay or a number of years, recognize that the Catholic Church is home and feel a warm welcome in our parishes and missions. May we always work hard in welcoming people into our parishes so that they see and experience the fullness of life in Christ through his Church. While the Year of Faith is no longer new, I am optimistic about the new possibilities of growing the Church as we continue to reach out to our parishioners through our diocesan census, our efforts of evangelization and catechesis, and through our pastoral care for them. Spring always brings a sense of joy as we witness the newness of life with the days getting longer and the flowers starting to bloom. It is my hope that we witness a similar newness of life in our faith as we deepen our relationship with Jesus Christ and commit ourselves to being his faithful disciples. With all that is happening in our Church – from the election of the new Pope to continuing to attend to the Diocesan initiatives of the Year of Faith – may these moments be a chance to reflect on our relationship with the Risen Christ and our desire to follow him. Let us pray for the strength and grace to bring Christ’s presence to those who hunger and thirst for the peace that only Christ can give.